On the tip of the Suva peninsula where their village once sat, the people of Suvavou welcomed the arrival of traditional wisdom holders from around the Pacific who converged for the Inaugural Pacific Philosophy Conference. 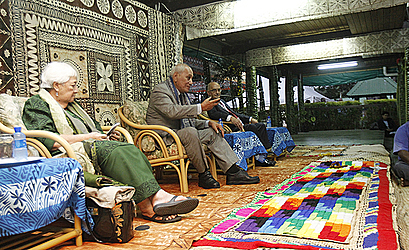 In a historic and significant ceremony at the Pacific Theological College where their ancestors lived before they relocated to make way for Fiji’s capital in 1882, the villagers embraced the elders who came together to share their knowledge in an attempt to reshape the future for the indigenous people of the Pacific Islands. From the i vakasobu (disembarkment) to the veiqaraqaravi (traditional welcome ceremony) for the elders led by Samoa’s former Head of State, His Highness Tui Atua Tupua Tamasese Efi and former High Court judge of New Zealand, Justice Sir Taihakurei Durei, a leading expert on indigenous customary law and the Treaty of Waitangi, the founding agreement between the Queen of England and Maori chiefs signed in 1840, there was a deep connection and acknowledgement. 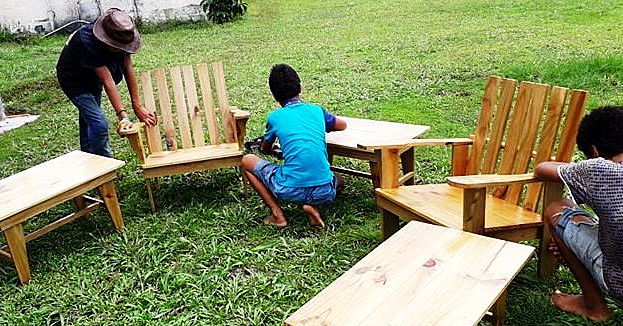 The villagers, in their words of welcome, said it was an honour to host the traditional custodians of indigenous knowledge on their soil and hoped they would impart a lasting legacy on their people, the rest of Fiji and Pacific islanders. Reciprocating the welcome, Tui Atua said he was moved by the traditional welcome and felt its genuinity. “We are an indigenous people. And we celebrate just about anything in dancing and singing. We have a shared culture, a shared genealogy,” he said. “You know as well as I do that the inter-marriages, the languages, many things, common ties we shared, the rich ceremonies, we recognise that this is a conversation. “This is what we are. To pass on to our children. It’s a wonderful, spiritual ceremony that unites us all. In a sense that in many ways we celebrate in our ways, in our chants, in whatever. Tui Atua told the gathering that his grandfather spoke Tongan and Fijian and it was proof of his relationship with the rest of the Pacific. He said one of the most beautiful farewells in Samoa was that of the Tui Viti when he went to Samoa before westernization came to the islands. “On the way home, a storm struck and he had to take refuge in Manu’a. “He had to stay there for over a year because they had to refit the whole fleet, built new boats to come to Fiji. At the end of this sojourn he did a farewell that is said to this day. “It goes like this. You have given me so much love I cannot possibly return. “But this I will say to you. My love for you I will not expose to the air lest it turns mouldy. Nor shall I put it to the ground so the maggots get to it. My love for you I place between my heart and my lungs. For as long as I have breath, it too will have life. “It’s a beautiful poetry, beautiful expression of a common heritage, of sharing love. This is what you have done to me, to us elders. It is special. Tui Atua said it is fitting that as the Pacific advanced on the Western concept of development, we should find out way back to wise ways of old that would help Pacific islanders cope with the associated problems brought on by westernisation. The conference – an initiative of a partnership between the University of the South Pacific, Fiji National University, Pacific Theological College and the Pacific Islands Association of Non-Governmental Organisation (P.I.A.N.G.O.) - aims to collate this wisdom sharing for our next generations to capture and adapt. Speaking at the signing of a memorandum of understanding between the partners yesterday (Tuesday), P.T.C. 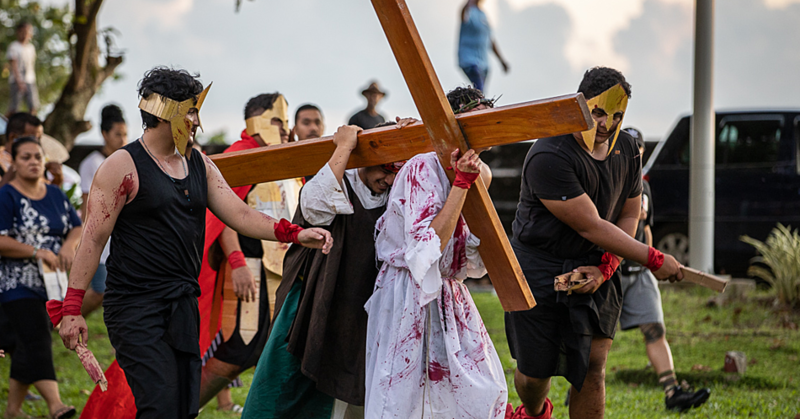 Associate Professor and head of Theology and Ethics, Reverend Dr. Upolu Vaai said the Pacific was faced with development changes that were causing the evolution of our ways. 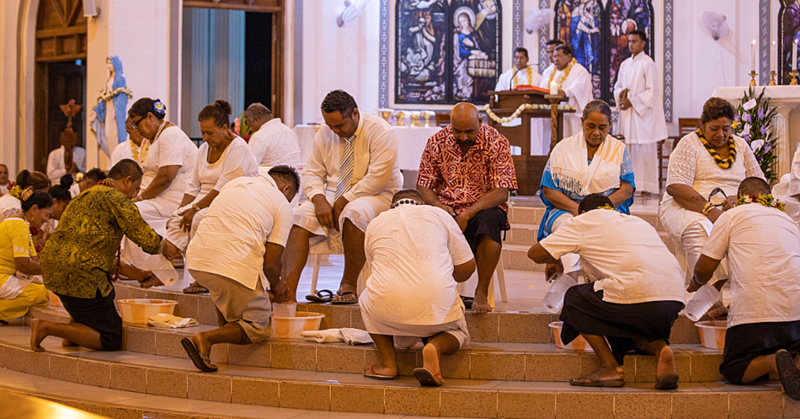 “This partnership came into being because of the common interest of these four institutions in the search for a new development narrative for the Pacific,” said Reverend Dr. Upolu. He said the conference is one that “decolonises education from the ground up, one that considers the voices of the global views, the local communities, especially the future generation leadership, the young people, one that is able to reweave the ecological mat in response to the environmental threat that is unfolding before our eyes”. She said for the past six years, P.I.A.N.G.O. had been operating under the theme - Rethinking Development, Reshaping the Pacific We want – and the conference was ideal in that it brought practitioners to the table. “When we get to talk about reshaping, what we found ourselves asking is if we are having challenges with current development models, what is the alternative? This partnership is the part of our journey to envisage and articulate an alternative paradigm of life,” Ms. Duituturaga said. “Pacific philosophy is very important. Many of our members, community people, work on the ground, in villages. A lot of them are challenged with competing philosophies of life. Ms. Duituturaga said P.I.A.N.G.O. was also working closely with traditional owners of Suva who will be involved in the conference since they are part of P.I.A.N.G.O.’s next generation leaders programme. Delegates were then treated to traditional dances depicting the different stories from around the region. The conference ended yesterday. His Highness Tui Atua’s paper will be published in full on Sunday. * Ilaitia Turagabeci is the communications officer for P.I.A.N.G.O.